Mobility scooter storage is a very important and often overlooked part of owning a mobility scooter. Storage sheds and equipment comes in a plethora of different styles, however most users opt for simple capes and covers. Storage for your mobility scooter is designed to provide you with protection from various potential problems including the weather, theft and general wear and tear. This article will take a look at the most prominent methods and equipment used to store scooters. 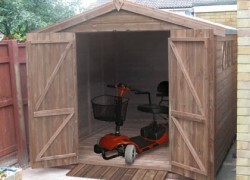 Mobility scooter sheds are simply the best option for storing your mobility scooter. They provide general protection that covers everything relevant. 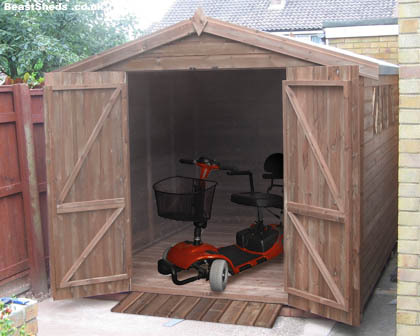 A shed will protect your scooter from the weather, from potential vandalism or theft and can even allow you to charge your scooter whilst being stored. Scooter sheds also will likely have a lot of extra room in which you can store spare parts and accessories. Burglars have been known to specifically target scooters to make quick cash through second hand sales and a lockable mobility scooter shed is perfect for preventing this. A scooter shelter is essentially a smaller type of shed. 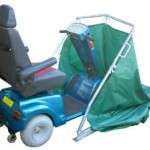 It will be made waterproof as well as fire-proof and provides many of the same benefits as a mobility scooter shed. This is an ideal option for those who like the shed but may not necessarily have the space to fit a full version on their property. The most commonly used form of storage is a simple cover. There is a wide range available with some being made from nylon and others with strong PVC. They will often be designed so they can fit nearly all types of scooters. Canapies and covers are really just an extremely practical, quick and effective form of storage. Though they will protect your scooter from the weather, they generally don’t guarantee any kind of protection from theft or vandalism. Constructed from robust PVC fabric, these foldable covering garages protect your scooter from the weather. They are ideally suited if you’re on the move a lot. They will save space, are extremely easy to operate, and very durable. Sometimes, they can be locked down to the ground (depending on the terrain) to ensure that neither the garage or the scooter is damaged or stolen.